coolest and smallest type currently defined (more). Designated UGPS J072227.51-054031.2 (or UGPS J0722-05 or UGPS 0722-05), this extremely dim celestial object may be one of the closest known solitary brown dwarfs to Sol at present, based on an updated distance estimate of around 13 +/- 2 light-years (4.1 +0.6/-0.5 parsecs) away from Sol (Ken Croswell, New Scientist, June 24, 2010; and Lucas et al, 2010). Detectable in infrared wavelengths, the substellar object is located in the central part (7:22:27.51-05:40:31.2, J2000) of Constellation Monoceros, the Unicorn -- southwest of Delta Monocerotis, Procyon (Alpha Canis Minoris); and Gomeisa (Beta Canis Minoris), and northeast of Open Cluster M50. On April 2, 2010, a team of astronomers (including Phillip W. Lucas, Chris G. Tinney, Ben Burningham, Sandra K. Leggett, David J. Pinfield, Richard L. Smart, Hugh R.A. Jones, Federico Marocco, Robert J. Barber, Sergei N. Yurchenko, Jonathan Tennyson, Miki Ishii, Motohide Tamura, Avril C. Day-Jones, and Andrew Adamson) posted a pre-print on this newly found object after analyzing data observed by the UKIDSS Galactic Plane Survey (UGPS), which were obtained using the United Kingdom Infra-Red Telescope (UKIRT) in Hawaii. While the distance estimate is preliminary, new parallax measurements are expected by mid-April 2010. As this object was found in observations from only six percent of the sky, many more such objects are expected to be found as more data from the UKIRT Infrared Deep Sky Survey (UKIDSS) or the recently launched NASA Wide-field Infrared Survey Explorer (WISE) satellite are analyzed (Lucas et al, 2010; Ken Croswell, New Scientist, April 9, 2010, with more discussion at UGPS 0722-05; and David Matson, Scientific American Blog, April 9, 2010). detected using infrared telescopes (more). UGPS 0722-05 is one of the coolest brown dwarfs known as of June 22, 2010 (along with DENIS J081730.0-615520), with a revised temperature estimate of around 207 to 287° Celsius -- 405 to 549° Fahrenheit, or 480 to 560° Kelvin (Ken Croswell, New Scientist, June 24, 2010; Lucas et al, 2010; and Artigau et al, 2010). The object is also the dimmest brown dwarf yet observed, as it is only around 0.000026 percent as luminous as our Sun, Sol. It radiates mostly at infrared rather than visible wavelengths, and so it would take some 3.8 million clones of this object to equal the Sun's radiative power. 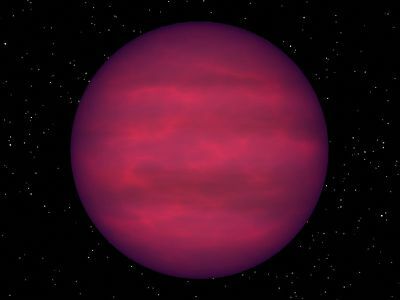 Although tentatively classified as a "T10," methane brown dwarf, its spectrum exhibits deeper water vapor and methane bands than other T-type dwarfs (plus "an unidentified absorption feature at 1.275 micrometers) and so may eventually be classified as the first example of a new spectral type (e.g., "Y"). In 2011, however, the brown dwarf was reclassified "as the T9 spectral standard" (Cushing et al, 2011). Roughly the size of Jupiter, UGPS 0722-05 is projected to have around 5 to 30 Jupiter-masses based on evolutionary modelling for similar brown dwarfs (Lucas et al, 2010; Ken Croswell, New Scientist, April 9, 2010; and David Matson, Scientific American Blog, April 9, 2010). Useful designations for this object include: UGPS J072227.51-054031.2, USPS J0722-05, and UGPS 0722-05.
are more magenta in hue (more). Extremely dim celestial objects, "... brown dwarfs are substellar objects with masses between those of giant planets like Jupiter and the least massive stars like Proxima Centauri. Some have been found as isolated objects, while others have been detected in orbit around stars or newly formed in star clusters. Since 1995, more than 100 methane brown dwarfs, or type-T dwarfs, have been found with spectra similar to that of the planet Jupiter, with effective surface temperatures between 500 and 1,300° Kelvin [227 to 1,027° Celsius, or 400 to 1,881° Fahrenheit]. The detection of even cooler objects has been eagerly anticipated by astronomiers and may open up a new arena for atmospheric physics and help to determine the formation rate of stars and brown dwarfs in our Galaxy as a function of both mass and of time" (Lucas et al, 2010, page 2). Although brown dwarfs lack sufficient mass (at least 75-80 Jupiters) to ignite core hydrogen fusion, the smallest true stars (red dwarfs) can have such cool atmospheric temperatures (below 4,000° K) that it is difficult to distinguish them from brown dwarfs. 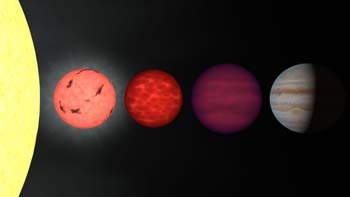 While Jupiter-class planets may be much less massive than brown dwarfs, they are about the same diameter and may contain many of the same atmospheric molecules. Wide field image with satellite trail. University of California at Berkeley astronomer Ben R. Oppenheimer, who helped to discover the other nearby brown dwarf, Gliese 229 b, is part of a growing group that would like to define a brown dwarf as an substellar object with the mass of 13 to 80 (or so) Jupiters. While these objects cannot fuse "ordinary" hydrogen (a single proton nucleus) like stars, they have enough mass to briefly fuse deuterium (hydrogen with a proton-neutron nucleus). Therefore, stellar companions with less than 13 Jupiter masses would be defined as planets. Many of the following star systems are probably located within 10 ly of UGPS 0722-05. Up-to-date technical summaries on UGPS 0722-05 may become available at: the Astronomiches Rechen-Institut at Heidelberg's ARICNS, the Research Consortium on Nearby Stars (RECONS) list of the 100 Nearest Star Systems, and the SIMBAD Astronomical Database. Although this constellation may have been named for the Unicorn prior to the 17th century, its first known historical reference is in Jakob Bartsch's star chart of 1624 as "Unicornu." Bartsch, the son-in-law of Johannes Kepler, is believed to have relied on earlier works that have never been identified. For more information about the stars and objects in this constellation, go to Christine Kronberg's Monoceros. For an illustration, see David Haworth's Monoceros. © 2010-2011 Sol Company. All Rights Reserved.